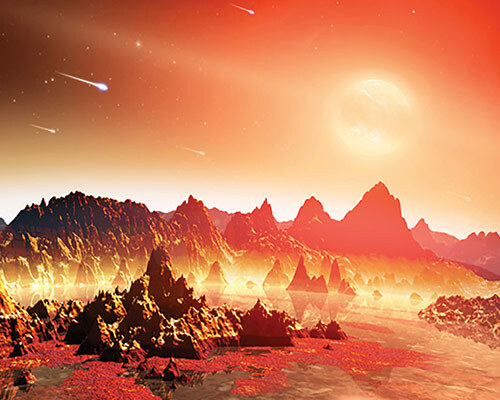 The origin of life on Earth presents the ultimate chicken-and-egg problem—the “which came first?” question must consider not two, but three possibilities. Even the most rudimentary organism needs a cell that can 1) convey information, 2) catalyze metabolic reactions, and 3) compartmentalize cellular subsystems. To fulfill these prerequisites, a cell must have nucleic acids, proteins, and lipids. These elements, scientists have supposed, could have come about one after the other, emerging from the primordial ooze at different times before somehow coming together. Another scenario—one holding that all the elements arose together at the origin of life—was thought less likely. The three subsystems just seemed too different, their chemistries incompatible. That is, with the biochemical building blocks that existed before life began, no shared chemical intermediates seemed plausible. The article describes how the investigators tested their idea experimentally. They examined the assembly of various biomolecular building blocks from “prebiotically plausible” intermediates and one-carbon feedstock molecules. According to a press release issued by the Laboratory of Molecular Biology, study co-authors Bhavesh Patel and Claudia Percivalle used conventional apparatus and reagents to simulate the sorts of chemistry that could have taken place on early Earth. The investigators had in mind a meteorite-pelted planet, one puddled with water laced with chemicals such as hydrogen cyanide and hydrogen sulfide. They took hydrogen cyanide through a series of chemical reactions and showed that it was possible to assemble precursors of ribonucleotides, amino acids, and even lipids—the precursors that provide the biomolecular building blocks for coding information in a cell, for producing proteins, and for creating the membrane compartments necessary for forming the first cell.